Evie and Winston wrote letters home to Mr and Mrs Tom Boothby, Win's parents. Some time ago, Evie gave her daughter Chris a little blue shoe box filled with letters and memorabilia. There are 16 letters in all, as well as many greetings cards and other scraps of paper. The letters are beautifully written, a serial history of the early years of their marriage. Both Winston and Evie had lovely penmanship. Winston almost always wrote with a fountain pen, Evie preferred a ballpoint. You can easily tell who wrote which letters because Winston dotted his i's with circles. When we asked about our childhood, our parents usually didn't have much to say "You were a sweet child" "You were trouble" The more children there are, the harder it is to remember all the details. Well, when it was happening, the details were quite fresh in their minds, so these letters are a bright window on the past. You see, the first letter was written when Chris was a baby; the last was written right before Donald was born. Of added historical value are the addresses, you can see where they were living when. 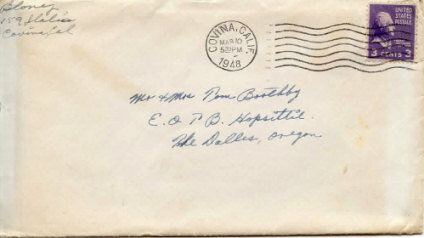 Several of the letters are addressed to "Mr and Mrs Tom Boothby, E.O.T.B. Hospital." Those initials stand for Eastern Oregon Tuberculosis Hospital, a sanitarium for Tuberculosis sufferers. Tom and Winnie worked there in the kitchen. Scanned by Mimi. Errors might have occurred. Letters and their contents property of the Boothby family.